Big Pit's wheel machinery for the ore and people lift. It's interesting that mines are called "pits" in Britain when we would tend to associate that with a surface strip mine or something like the Kennecott Copper Mine, spiraling down to remove a whole mountain of ore. 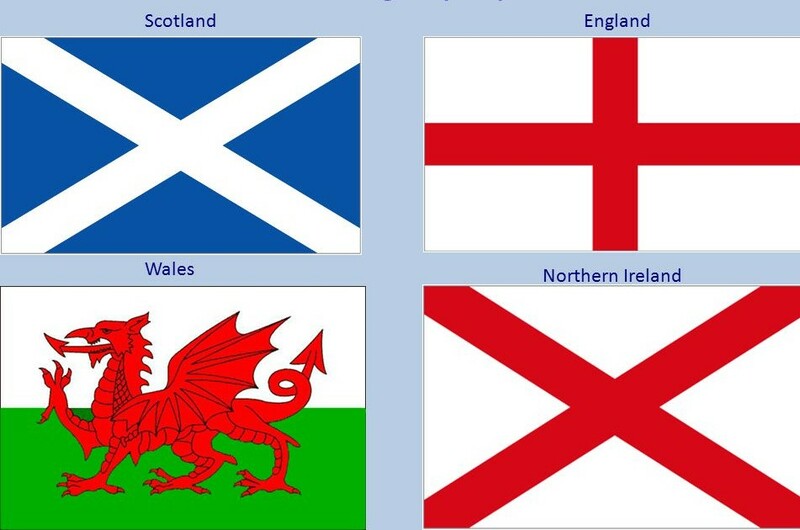 It might be because the word in Welsh is "pwll" which is a cognate for "pool" and also means "mine." 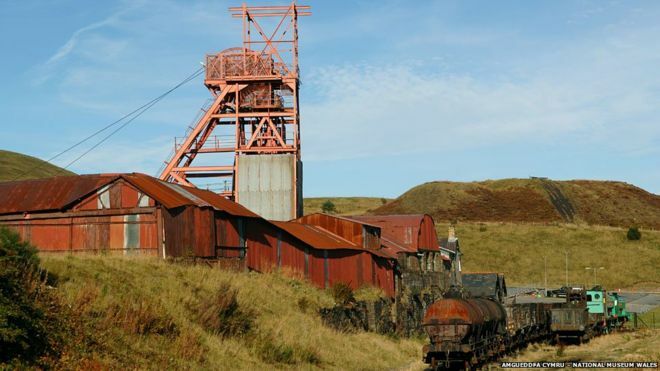 The Big Pit in Blaenavon, just over the hill from where my ancestors lived, is known as Pwll Mawr in Cymraeg. We were not allowed to take pictures in the mine which was good in a way because my SD disk went haywire that day. That bothered me ever since because I had limited surface shots, but then I realized there would be pictures on the web! I've been in potash mines in New Mexico. This was my first coal mine. And it was fascinatingly horrifying. The Big Pit website even had a photo of the guide who took us down. He had worked the pit and told his stories with that unique Welsh mix of laughter and tragedy. We donned our safety equipment and went down the shaft in the lift (or descent). At the bottom, our head-lamps glittered on shiny blackness. 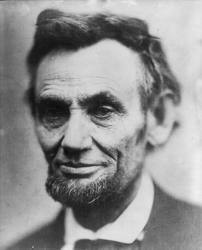 We heard stories of death and suffering and the pride of hard work. While our guide expressed his deep loathing for strike-breakers, he also explained what the strength of union was. You don't wait for the canary to die, by the way. Once the canary starts to act a bit odd, you are supposed to run for the shaft, every man for himself. But that's not what they do. They look out for each other and would rather die helping a fellow worker than save themselves in shame. 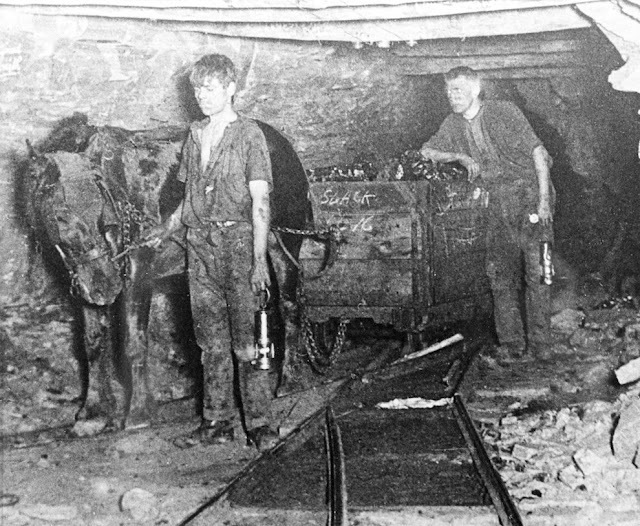 Poisonous gas is only one way to die in a mine. There are cave-ins, explosions, fires, any accident of machinery and mistake, and even floods. And then if you do survive into old age, the lung diseases come. 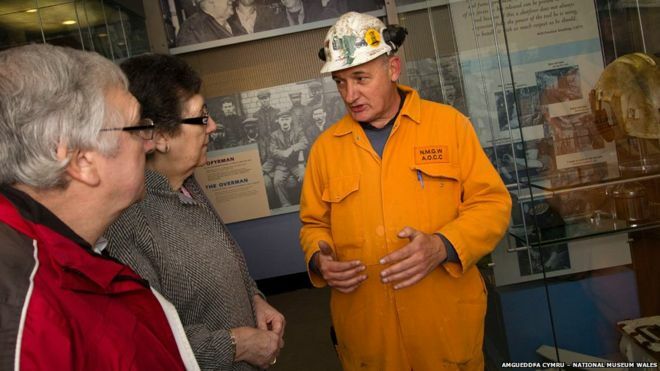 I'll share here some photos of this mine and similar ones from the area from the Big Pit National Coal Museum. I would encourage any and all to visit. Even for those who don't go down in the mine, there are wonderful displays and experiences on the surface. Another tour underground. 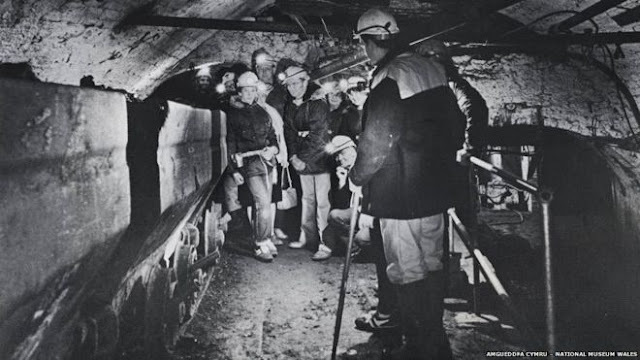 No sense in color photography in a black and gray coal mine. Underground ponies. Some never saw the light of day. Ponies were used even into modern times. Lunch break. Note the young boy in front. 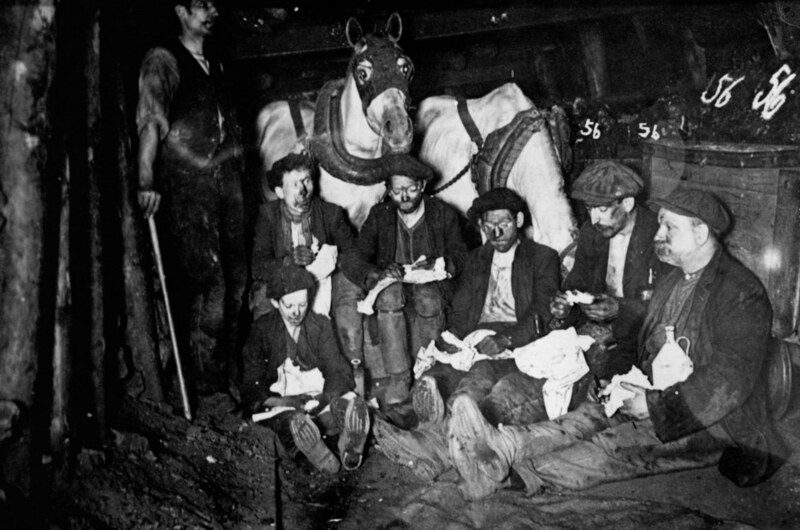 In the 18th and 19th Centuries, women, children, and men all worked in the pits. 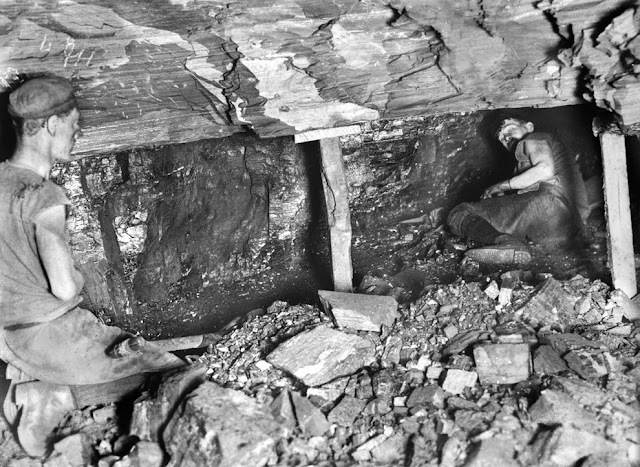 There's that shiny blackness of the face as this miner works under a ledge. OSHA compliant? Let it not be forgotten that Welsh coal and iron spurred the industrial wealth of Britain and the fantastic riches of a special class of capitalist. There were great lords who piled the gold high on the broken bodies and blood of men, women, and children of South Wales. National Coal Board map taken by me in the visitor's center with my cell phone. 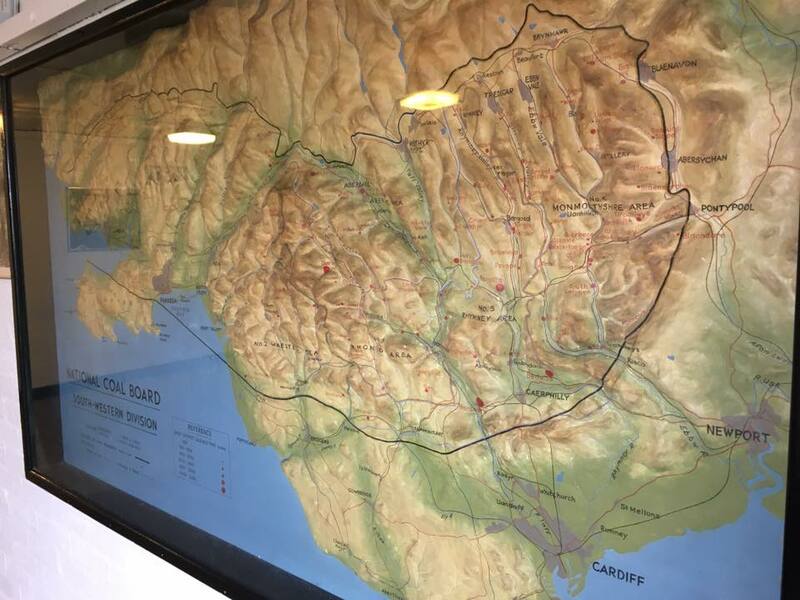 Note Blaenavon and Abersychan on the far east side, both places where my fore-bearers lived. The reflection of the lights makes this look like the face of a monster which this coal country was at one time.